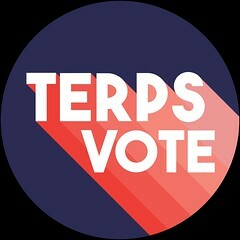 We are a non-partisan coalition dedicated to providing information and resources to student voters at the University of Maryland. Visit our State Directory to find up to date information about candidates and voting dates and deadlines in your state! If you are not registered to vote, SGA's TurboVote can help you register and request an absentee ballot in any state. Check out our Calendar and Events pages for more information regarding ways to get connected with other student voters on campus! If you are an organization that would like to post an event on our calendar, contact us.